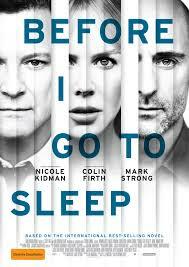 I have just finished reading S J Watson’s best selling novel, ‘Before I Go To Sleep’, (which has recently been made into a film with Nicole Kidman and Colin Firth) and it is one of the best books I have read in a long time! Not only is it an intense thriller that keeps you on the edge of your seat and shocks you with plot twists galore, it has an amazing storyline and subject that really makes you think and re-evaluate your life. The general plot overview: It is about a 40-something woman who can’t remember who she is or any of her past, every morning she wakes up. A doctor urges her to start keeping a journal every day to keep track of what she learns about herself and her life so that she can remind herself every morning she reawakens. She gradually begins to realise that her husband is not being completely honest with her, changing details about her past, as she tries to piece together her life since the accident that left her an amnesiac. It is a brilliant book, so I would recommend it to anyone who loves a good thriller. I finished it in the space of a week, reading on commuting trains etc., so it is very easy to read, but this doesn’t take away from the fact it is a very well written story. Or if you’re not much of a reader, go see the film currently in cinemas! I’m sure it will be good too. Now, this book did get me thinking, and made me pretty sad at times. To wake up with no memory of who you are, where you’ve been, what you’ve done with your life, to not remember your loved ones, is pretty devastating. And there are many people who will live lives like this in the world; having amnesia, and even just generally growing old and not being able to cling on to your memories any more. I feel, personally, that without my memories I wouldn’t be the person that I am today and will be in the future. Every experience we have, every person we meet, all affect us and our personalities. They are the building blocks on which we grow and progress, just as you need to practice a sport to develop, you need your experiences to develop and learn. Without core things, such as memories, how can we progress? Just like Christine, the main character in ‘Before I go to sleep’, we would live in a kind-of limbo, never being able to move forward or do anything with our lives as we would be so occupied trying to function in the present day that we wouldn’t be able to build anything to carry forward to tomorrow. Every little thing that has happened to me in my past has influenced my present. From the most trivial arguments I had with school friends as a child, to my experiences of love and loss as I have grown. Even down to the way I have spent and saved my money, how much I have drank on a night out, appreciated the nice weather and beautiful surroundings on a dog walk, and changed the colour of my hair. It all has shaped me for better, for worse. If I hadn’t had three younger siblings, or was an only child, or even one of a pair of twins, or even was just third in the line of siblings that I do have, I would be a different person. Just now, I am cooking some chicken for lunch, and as I flipped my half-cooked chicken the smell reminded me of my grandparent’s house. I don’t know why, I don’t know if they even cook chicken very often, but just that second of smelling something familiar triggered a memory. A fond memory of people I love and times I feel safe. To ever lose that or forget that would be heart breaking. Without being able to remember my loved ones, places we had been together and experiences we had shared, I wouldn’t know what it was like to love. If I couldn’t remember the times I have walked the streets alone at night, or went in the Edinburgh dungeons, I wouldn’t know what it was like to feel fear. (I also wouldn’t have learnt not to wander the streets at night alone…) If I didn’t remember my friends from throughout my life and the antics we got up to, I wouldn’t know how to laugh and have fun. If all these memories were taken away from me, I would be a hollow shell. While I don’t completely agree that animals have no memories (other than goldfish), we are a lucky species to have such superior brain power. Without mental capacities, such as memory, we wouldn’t have developed as we have. Our memory capabilities are what set us apart from other creatures. So without it, are we no more than animals? That thought frightens me, but humbles me. I hope I never have to face a world without my memories. At the end, they are all we have left to remind us that life is worth living. As long as I have them intact, and can remember who I am and who I have loved, then I can be satisfied that my life was wonderful.